A professor recommended strategy to help you prepare for your exam. 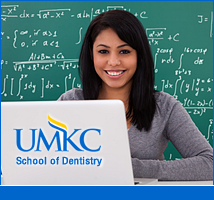 Professor developed review courses at a fraction of our competitors. Understanding your strengths and weaknesses makes reviewing more efficient. Got a few minutes? Let's review! 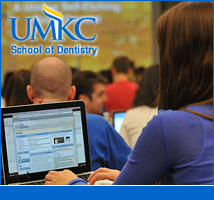 UMKC School of Dentistry’s National Board Review Courses have been developed by over 18 full-time professors. We’ve developed a strategy to help students prepare for their boards using a practical approached based upon each student’s individual knowledge base. 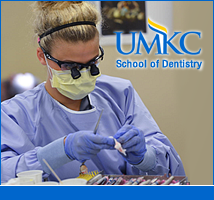 The American Dental Hygienists’ Association’s Dental Hygiene National Board Review Course is the most comprehensive review course for dental hygiene students. Our new format allows students to personalize the course based on their own strengths and weaknesses. 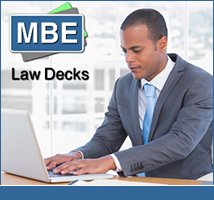 The MBE Law Decks help you prepare by working on test-taking skills, like critical thinking, problem solving, and content review while we track your strengths and weaknesses to help you develop a strategy before your bar review course. A diagnostic tool to develop an effective strategy! Making your review process as efficient as possible requires an understanding of what you know and what you don’t know. This includes tracking your guesses. This is the key to developing a strategy as you begin reviewing for your exam. Learn how to study smarter. The key to a good review course or product is in the quality of the content. That’s why we utilize so many professors to develop our content – people that teach this content full-time. Most of them have authored textbooks and research papers. Many have previously written exam questions! Your time is valuable. So studying where you want and when it’s convenient is important in maximizing your time. That’s why you can access any of our courses or prep tools from any computer or mobile device with Internet access. Check out our mobile app for iOS and Android today! Study more efficiently and cost-effectively! CE Webinar Register Now! When preparing for your boards, bar exam, or entrance exam, we recommend you start with an assessment of your knowledge base. Determining your strengths and weaknesses as you begin to prepare for your exam is crucial in maximizing the small amount of time you have to review several semesters of content. Our assessments serve to do more than just tell you what you know and what you don’t know. 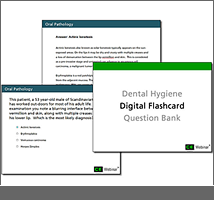 They also help you practice exam-style questions so that you get acclimated to the testing environment. Learning how to test is just as important as knowing what’s on the test. In all standardized testing, there is an assumption of knowledge that each student must have in order to do well on the exam. As you go from high school to college to grad school, the amount of knowledge you are required to know grows exponentially. The first part in understanding the test you’re about to take is ensuring that you have studied sufficiently to adequately answer all questions. The second and equally important part of preparing for an exam is to understand how test writers construct the questions.To do this, we recommend you examine all answers – correct and incorrect answers. Understanding why an answer is correct and why the other answers are distractors gives an insight into the mind of the test writers. Eventually, a pattern emerges that allows you to eliminate impossible or improbable answers thereby increasing the odds of you getting the right answer, even when you don’t know the answer. Crucial to doing well on your exam is managing your time. Unfortunately, too many students find themselves at the end of a section of a test with very little time and way too many questions left to answer. Why does this happen? Because most students prepare for the exam by reviewing the content and practicing taking test questions without practicing their timing. How do we practice our timing? It’s pretty simple. For every exam, there is a student guide that tells you how many questions are in each section and how much time you have for that section. It’s a simple math problem to determine the amount of time you have for each question in each section. Once you have determined the amount of time you have for each question on each section, you need to set a timer for each set of practice questions you do. Stick with the timer and stop when the timer goes off. Answer why each question is correct and why each incorrect answer is a distractor to help you understand how the test writers think but make sure the timer is ALWAYS present. Eventually, you will develop an innate sense of timing for your exam which will force you not to linger too long on any one question. Be sure to set a strategy for easy questions and hard questions. It’s usually more efficient to go through the easy questions first and mark the more difficult question for later to ensure you give the maximum amount of time you need to deduce an answer. The final item to consider as you prepare for your exam is your testing environment. Make sure you know what you are allowed to bring into the testing center and what you are not allowed to bring. Too many students have made the mistake of not reading the requirements for the testing center only to find their test voided before they begin. You should also plan for a cool testing environment. Dress warmly and in layers. It’s easier to peel layers to be comfortable rather than being too warm or too cold as you are taking the exam. Finally, be sure to know how to take the exam at the time it is being conducted. If you are not a morning person and the exam begins at 8am, you may find that a good night’s sleep might not be enough to be at your optimal state of alertness. Practice studying at early hours to ensure that you have acclimated yourself to the appropriate time of day. Be careful what you eat as well. Fried foods tend to make you sleepy. This is particularly important if your exam is an all day event. I felt that the explanations was much simpler to understand than when I took the class in the program. The professor was very helpful.